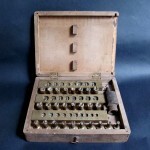 Beschreibung/Description: Extrem seltenes Dental-Set aus Messing: damit wurden Zahnkronen aus Gold hergestellt. Vollständig (30 Teile) – sehr guter Originalzustand. Beim Holzdeckel der Kassette fehlt eine kleine Leiste. 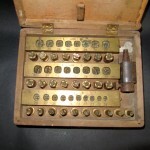 Extremely rare dental set of brass: it was used for production of dental crowns made ​​of gold. 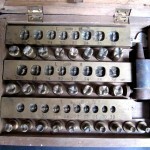 Completely (30 parts) – very good original condition. The wood cover of the cassette is missing a small bar. Abmessung/Dimension: 18 x 14 x 4,5 cm = 7,1 x 5,5 x 1,8 in.